Info Joseph Robinette Biden Jr.
Just weeks after the election, tragedy struck the Biden family, when Biden's wife, Neilia, and their 1-year old daughter, Naomi, were killed and their two young sons critically injured in an auto accident. Biden was sworn in at his sons' hospital bedside and began commuting to Washington every day by train, a practice he maintained throughout his career in the Senate. In 1977, Biden married Jill Jacobs. Jill Biden, who holds a Ph.D. in Education, has been an educator for over two decades in Delaware's schools. Vice President Biden has three children: Beau, Hunter, and Ashley. Beau serves as Delaware's Attorney General and is currently deployed to Iraq as a Captain in the 261st Signal Brigade of the Delaware National Guard. Ashley is a social worker and Hunter is an attorney. Vice President Biden has five grandchildren: Naomi, Finnegan, Roberta Mabel ("Maisy"), Natalie, and Robert Hunter. As a Senator from Delaware for 36 years, Biden has been a leader on some of our nation's most important domestic and international challenges. 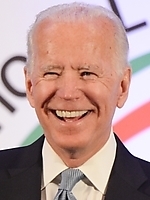 As Chairman or Ranking Member of the Senate Judiciary Committee for 17 years, Biden was widely recognized for his work on criminal justice issues including the landmark 1994 Crime Bill and the Violence Against Women Act. As Chairman or Ranking Member of the Senate Foreign Relations Committee since 1997, Biden played a pivotal role in shaping U.S. foreign policy. He has been at the forefront of issues and legislation related to terrorism, weapons of mass destruction, post-Cold War Europe, the Middle East, and Southwest Asia.